“It’s as if she knows some truth that other people are blind to.” Arthur Miller’s Broken Glass, set in 1938, is a study of race and racism, the Political and the personal. At the heart of it all sits a woman, in seemingly perfect health, paralysed from the waist down because of what she reads in the papers. The title refers to the infamous Kristallnacht, or “Night of Broken Glass”, in Nazi Germany. After seeing images from that night, Sylvia Gellburg – a jewish woman – becomes paralysed – despite living 3,000 miles away in Brooklyn, New York. She is suffering from “hysterical paralysis” but neither her husband, her doctor, nor her sister are sure why. Antony Sher takes the central role of Phillip Gellburg – the black-suited, unimaginative mortgage specialist married to Sylvia – in Iqbal Khan’s production. Sher’s voice is full of the emotion that Gellburg is unable to express: it tremors as he tries to find the right words. Hair slicked back, neck stuffed into his shirt, he is every bit the “prune” that his wife describes. Sher makes this play: Gellburg is a bore and yet in Sher’s hands he is brilliantly, endlessly fascinating. Miller’s play is saturated with Jewish culture – Yiddish words are sprinkled throughout and Khan makes sure all the characters are acutely conscious of their “jewishness”. Not least Gellburg himself, who repeatedly tries to hide his too-obviously-Jewish face. 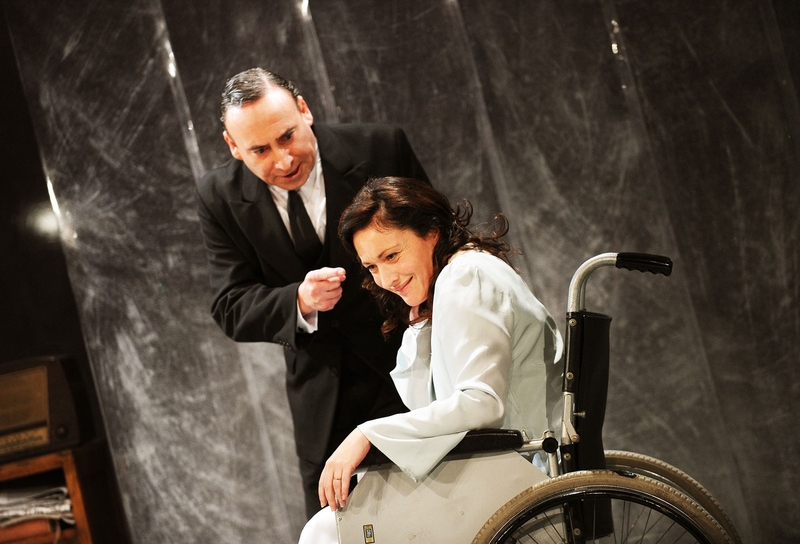 Lucy Cohu, as the paralysed Sylvia Gellburg, could not be more Jewish: her gestures, her softly undulating intonation, her throwaway Yiddish. All these combine to create an ideal: she is the image of a Jewish woman. But, of course, as Miller makes us realise, that’s all it is: an image. The third character in the play’s central triangle is Dr Harry Hyman. In the role, Nigel Lindsay is a jolly GP, all firm hand-shakes and bed-side manner. By the end of the play, Hyman is well out of his depth: and Lindsay does not shrink from showing this. Emily Bruni is forthright as Sylvia’s even-more-Jewish sister while Madeleine Potter as the doctor’s wife manages to create a complex character from very little material. It’s a pity, though, that we don’t see more of Brian Protheroe – he’s rather wasted in the small part of Gellburg’s boss. As well as having a simply stellar cast, Khan’s production is brilliantly put together. Mike Britton’s design manages to make the Tricycle’s stage appear both bigger than it actually is and give a sense of Sylvia’s claustrophobia. The peeling walls hint at a mental institution; a cellist (Laura Moody) plays angular melodies while floating ethereally behind a misty screen. Miller’s premise is brilliant and this cast was never going to let it down. Accents do slip occasionally and undoubtedly the acting is over the top – but then so is the play. Khan’s production leaves you with the somewhat uncomfortable feeling that you’ve looked at your own life through a spotless and powerful lens. Broken Glass is on at The Tricycle Theatre, Kilburn until 27 November. This review first appeared in the Willesden and Brent Times on 13 October 2010.